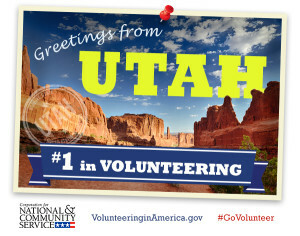 SALT LAKE CITY – For the 10th consecutive year, Utah has been ranked 1st in the nation for volunteerism by the Corporation for National and Community Service. Last Friday, Gov. Gary Herbert and the Utah Commission on Service and Volunteerism announced Utah’s No. 1 spot on the Volunteering and Civic Life in America 2015 report once again. Research from the VCLA 2015 report found 46 percent of Utah adults volunteering. The report is part of the most comprehensive study of volunteering and civic engagement across the country, according to a press release from the governor’s office. The data is gathered annually through the Current Population Survey conducted by the U.S. Census Bureau for the Bureau of Labor Statistics. 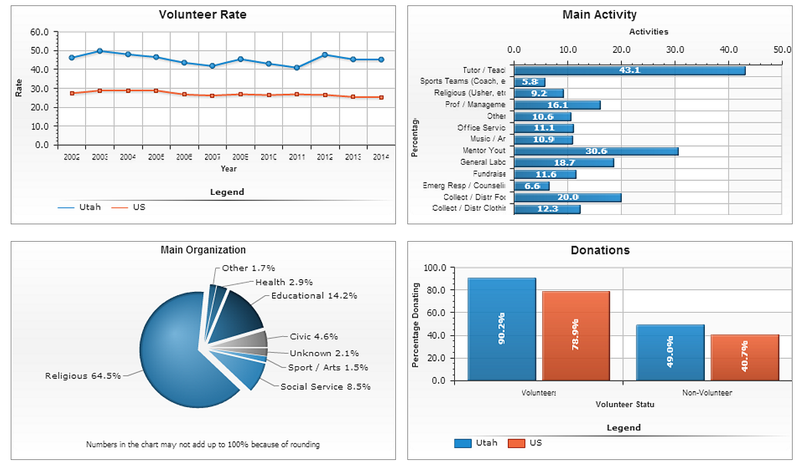 Data was collected on the volunteering and civic activities of Americans age 16 and older. According the CNCS website, the top three volunteer activities in Utah are: tutoring and teaching at 43.1 percent, mentoring youth at 30.6 percent, and collecting and distributing food at 20 percent. Utah was followed by Idaho in the No. 2 spot with 35.8 percent and Wisconsin in No. 3 with 35.4 percent of adults volunteering. The national average for volunteering is 25.3 percent. Organized volunteering was largely spearheaded through religious institutions at 64.5 percent, with educational and social services-related organizations coming in second and third with 14.2 percent and 8.5 percent respectively. Around 78 percent of all Utahns engaged in informal volunteering, or what can be considered neighbors helping neighbors in some way. The national average informal volunteering is 65.5 percent. A culture of volunteerism — giving time in service to others — is one thing that sets our state apart. As Utahns, we seek to serve selflessly and are always ready to lend a helping hand to those in need. And in turn, that service transforms those who serve. I am proud to represent a state that cultivates the spirit of volunteerism in its citizens, young and old. 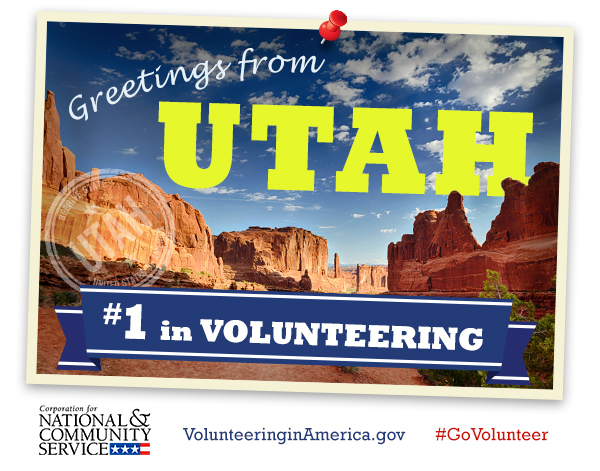 The total economic value of volunteer service in Utah is $4.5 billion based on the national hourly value in 2015. More than 950,000 volunteers served approximately 193.7 million total hours, an increase of 38.8 million from 2014. The VCLA report also rated volunteerism in individual cities. Salt Lake City ranked No. 1 in the nation in the metropolitan cities category, with Provo and Ogden snagging first and second place for mid-sized cities. Nationally, one-in-four Americans volunteered through an organization, with three out of five helping their neighbors in some way in 2014. This year’s VCLA report found that 62.8 million adults — 25.3 percent — volunteered through an organization last year. All together, Americans volunteered nearly 7.96 billion hours last year, worth an estimated $184 billion, based on the Independent Sector’s estimate of the average value of a volunteer hour. 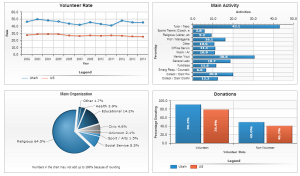 The volunteer rate consistently remains stable and strong. Over the past 13 years, Americans volunteered 104.9 billion hours, worth an estimated $2.1 trillion. In addition, more than 138 million Americans — 62.5 percent — also engaged in informal volunteering in their communities, helping neighbors with such tasks as watching each other’s children, helping with shopping, or house sitting. “We are calling on Americans to volunteer in their communities and to invite their friends and families to join them,” said Wendy Spencer, CEO of the CNCS.